This workshop was a success! We raised money contributed to a charity in Guatemala, the Konojel Community Center. Konojel trains people for employment, feeds hungry people, and offers educational enrichment. Also, it was an honor to share with a wonderful and receptive group of people . Learn to Read the Akashic Records was offered as a workshop on Lake Atitlán in San Marcos la Leguna in Guatemala on Saturday, February 18, 2017. ~Discover your angelic, galactic and/or Earth lifetimes to better understand your soul orgins from which you originate. ~Find out information that can benefit your life now from knowing your purpose, having inner guidance and healing and wholing. The Akashic Records are an energetic imprint of everything that has happened in time and space, every thought, feeling, event and experience. All is present within the quantum field and we can access the Akashic Records through our multidimensional senses. The divine wisdom and knowledge available is a gift to everyone. 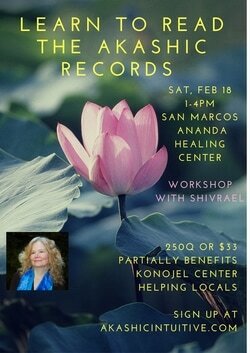 This class is includes tips to help you enter the records and a guided meditation experience in which we will do that together in sacred space. We will share what we discover with one another. Shivrael is a teacher, writer, public speaker, healer and Akashic Reader in Mt.Shasta, CA which is a sacred vortex site on the planet. Website: http://www.akashicintuitive.com. You can read my blog, and about the Inner Guidance Course that happened this fall. This is my second journey to Guatemala. Last winter I discovered this wonderful spiritually oriented town with amazing energy. I didn't really want to leave, so missed traveling to other places in Guatemala such as the pyramids of Tikal, because it just felt so great to be there. Perhaps you feel that too, if you have been there? On the journey I connected to the people who are doing good work in this town to benefit the local Guatemalans. Konojel (menaing all together in the local Mayan language) helps by offering healthy vegetarian food for most hungry people, educational enrichment to children, and employment training for women and adults. All of their work is sustainably based and making a difference in San Marcos. As a visitor who received the benefits of this town and the people, I wish to give back by making this workshop a benefit to the Konojel Community Center. Thus 1/3 of the proceeds for the workshop tickets are going to there, plus any donations on top of the $33/250q fee are being donated to this worthy cause. How to Register A minimal donation of $33 is requested. Anything over that goes directly to Konojel as do 1/3 of the profits from this workshop. You can also show up on the day of the workshop, if space is available, for 250q. Reserve your spot via email, or better yet pay via Paypal now with the button below. Contact me at shannon at yogisource.com (my legal name is Shannon Brophy, and I go by Shivrael, or Shivrael Luminance River. This is my Akashic Records website, AkashicIntuitive.com. You can go here to sign up for the workshop with the basic price or adding a donation to Konojel on top of the workshop ticket. When I receive your payment, I will then send a confirmation. To register, simply feel out the form and send money via paypal with the buy now button below. Thank you! I am traveling in Guatemala prior to arriving in San Marcos. Contact me if you would like a reading in person after the 10th of February at half-price discount, if you are signed up for the workshop. The confirmation of your payment for the workshop from paypal can be the receipt to enter the workshop. Thanks for helping others and helping yourself through attending this workshop!